MPG-o-Matic Chevy Tahoe Hybrid Review Summary: The 2009 Chevrolet Tahoe Hybrid is a traditional truck-based full-size three-row SUV with a big difference. The Tahoe Hybrid’s two-mode hybrid system functions as promised, delivering a substantial jump in fuel economy when compared to the conventional Tahoe. Make no mistake about it. The 2009 Chevy Tahoe Hybrid is a great big truck that integrates some innovative technology. With room for eight and plenty of hauling power, the traditional Tahoe has been a popular choice for large active families. The new two-mode hybrid system provides considerable benefits in lower-speed operation – whether you’re cruising through town or crawling through the parking lot at the local sports complex. The Tahoe Hybrid’s 6.0-liter V8 engine produces 332 horsepower (HP) and 367 foot pounds of torque. The big V8 is mated to a two-mode continuous electric ratio hybrid transmission with four fixed gears. While the Tahoe is traditionally quite thirsty, the Hybrid version uses its 300 volts of energy storage and Active Fuel Management on the V8, to good effect. The official mileage estimates for the 2009 Tahoe Hybrid are 21 city / 22 highway miles per gallon (MPG) for the two-wheel-drive (2WD) version and 20/20 for the all-wheel-drive (4WD) version. We put nearly 600 miles on our 4WD Blue Granite Metallic Tahoe Hybrid review unit and were able to squeak by the official estimates, with an average of 22.1 MPG on the Interstate highway and 22.5 MPG combined. Overall test period temperatures ranged in the thirties through fifties, with freeway speeds between 60 and 72 miles per hour (MPH). Highway testing temperatures were in the forties. Outside of the big front air dam and badges, most folks won’t know you’re driving a hybrid. The Tahoe Hybrid will crawl under electric power at speeds under 30 miles per hour (MPH) or so, but you need to have a very light foot to take full advantage of the hybrid system. 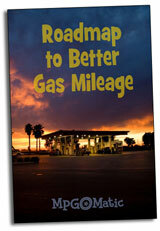 After a day or so of training yourself, you’ll be able to achieve the maximum MPGs from the vehicle. You’ll use three information displays in your quest for maximum mileage. The first is the Economy gauge. It’ll swing to the right under acceleration, and back to center when you lift off the gas. The Driver’s Information Center provides a host of data, including our favorite: Instant Fuel Economy. This is the tool you’ll use to fine-tune your driving style. Once you lighten up on the throttle, the V8 engine can kick down to just four cylinders via Active Fuel Management. It really pays to keep an eye on the Instant Fuel Economy display and use a light foot. While the MPG numbers might not seem overwhelming, this is a big heavy (4WD: 5835 pounds/2WD: 5617 pounds) vehicle, and the Two-Mode Hybrid system represents a significant first step. We expect to see dramatic gains when Chevy adopts larger capacity Lithium Ion batteries, and plug-in technology.